A/DA returns with a genuinely new product, full of different tones and myriad features. It's initially a little intimidating. Not everyone will be able to get the best from it. Back in the 80s, one of the most-used products by guitarists of a certain style was the A/DA MP-1, a 128-patch, programmable 19-inch rack preamp that was the first to combine value with what was, at the time, a mind-boggling level of MIDI-driven versatility. It offered a modest number of voicings, plus an onboard chorus that caused players of the time, still reeling at the demise of the original Van Halen line-up, to scrabble for their piggy banks. What's more, in those halcyon pre-Nevermind days, it sounded fantastic. "Back in the 80s, the A/DA MP-1 was one of the most-used products by guitarists of a certain style"
Shredders Jason Becker, White Lion's Vito Bratta and Paul Gilbert based their tone around the MP-1, and arguably its most famous application was by Extreme's Nuno Bettencourt on the band's massive second album, Pornograffitti. Steve Vai used one on his Passion And Warfare opus, too, but the unit's appeal wasn't limited to the back-combed, fleet-fingered brigade. Players as diverse as Metallica's James Hetfield and Kirk Hammett, Sepultura's Andreas Kisser and, more recently, Feeder's Grant Nicholas have all indulged. This reviewer worked in retail during the MP-1's heyday, and it sold like hot cakes; stores couldn't get enough of them. We asked A/DA about those early days. "It took a few months for industry and players to warm up the to the MP-1's concept of 128 amps in a single product," says A/DA's David Tarnowski, the designer of both the original preamp and this brand new version. "Interestingly the UK understood it first and I wasn't surprised about the popularity because it really solved a lot of problems and sounded great." Spooling forward to 2012, the new APP-1 has been designed by Tarnowski but isn't intended to be simply a reissue of the MP-1. "The APP-1 tone is closer to an older Fender in terms of the tone stack, and the classic A/DA tone is very different. We'll be making an A/DA MP-1 version in the future." The APP-1 is an all-solid-state analogue affair, and is a genuine preamp, not an overdrive pedal. There's no on/off switch and the best way to use it would be with a separate power amp and speakers. It offers two independent channels, each with a dedicated three-way EQ plus drive and master pots, and the character of the tones you dial in are based upon three voicings selected by a three-way slider on each channel; clean, OD and Dist. Also included is A/DA's D-Torsion Core technology, which adds a Dynamic pot into each channel's equation to add squeeze or bloom. "D-Torsion Core is a new way of giving guitarists another degree of expression so that the way they play the strings allows for timbre changes, not only to their tone but also to the dynamics of the sound," explains Tarnowski. Other features include a switchable master boost, which adds up to 16dB of level hike, a mono effects loop plus return level mini-pot, and a dedicated tuner out. There's a variety of modes of operation that can be chosen via a number of slider switches, such as using just the boost, or the preamp plus the boost and so on. These all have to be set manually as none are switchable remotely. As mentioned, the APP-1 is designed to operate at its best when used in conjunction with a power amp and speakers. For many these days, that would be considered an unusual backline arrangement, so one method of hooking it up to your existing rig would be to utilise your amp's effects loop. The return jack is a direct input to the power amp section, so go ahead and plug your guitar into the input of the APP-1, run the output to the return and away you go - you're effectively bypassing your amp's preamp stage so you don't need to plug anything into your amp's input. The amplifier's master volume will still operate as normal. Of course, a dedicated power amp input is ideal. 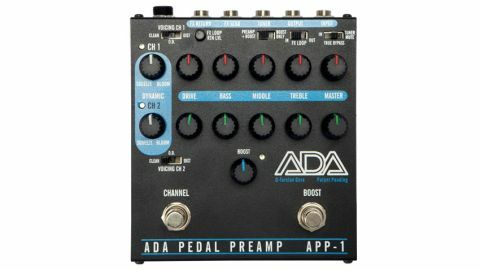 "A pedal-sized preamp may be an unusual concept, but it's one offering many options for those in a tonal rut"
If your amp has no loop, "plug into your cleanest channel with very little [amp] drive," says Tarnowski, "so the distortion is generated [solely] in the APP-1. It has a lot of dynamic range and can easily overload a preamp or a stompbox if it's not set properly." The three voicings for each channel aren't pre-set levels of gain but actually different EQ contours that can be used to shape the tone before it hits the D-Torsion's overdrive circuits. In fact, the EQ sections of each channel are very sensitive, which does enable you to get down to the nitty gritty of your tone - we find sticking with the clean voicing for the most part gives the fullest tonal base. As ever, though, it's horses for courses and comes down to your personal preference - the OD and Dist settings are perfectly usable, too. Rock styles are well served with the fierce high-end easily corralled by the efficient EQ and, with lower gain settings, we find the Fender-y character Tarnowski refers to. Bristling with bark and width, it sounds great with single-coils, not quite as fat as classic SRV tone, but certainly more than strident enough for Gary Moore-style licks. Clean tones are warm and rich, especially with a humbucker-loaded guitar, and each time we twiddle a knob or change a voicing, we find new sounds to enjoy. We could have experimented with the D-Torsion way beyond our sound-test period. The fattest, most valve-like sounds are found with the control set around three quarters towards Bloom, while for hard metal styles with a higher gain, more Squeeze is the order of the day. The boost function is among the most efficient we've come across, offering a clean and dramatic increase in output without any additional colouring of your sound. Allowing your guitar solos to be heard above the racket of a rock band - not to mention the other guitarist! - is an issue for many; here, it doesn't even represent a bump in the road. Aside from what is a disappointingly noticeable signal dropout when switching between channels, we're impressed and we can certainly see that it will have many uses outside of the rock sphere. Let's be clear: this is neither an MP-1 for the new millennium, nor an overdrive pedal. It's a genuine guitar preamp, and what's more, it's one that offers a high level of user interaction that can result in a huge choice of tones. Setting it up can be a little daunting, but trust in your instincts and, as long as your existing amp has an effects loop, you should be able to incorporate the APP-1 as described without any issues. A pedal-sized mono preamp may be unusual, but it's a more than valid one, and the APP-1 offers many an option to those in a tonal rut, whether you enjoy the powerhouse blues of SRV's Pride And Joy, the high- octane shred-ready tones of Racer X, or just about anything in between.